Finding cheap places to eat in Washington D.C. was not easy. There were a lot of fantastic choices for meals around where we were staying by the Convention Center but I wasn’t always in the mood for a sit-down, cloth napkin kind of meal. Our third day of this trip to DC started really early in the morning and ended really late at night. We finished our day a little before midnight. As we were walking back to the car to head back to the hotel, I asked my colleague if he wanted a pizza. I had spent about half my shift looking for a carry-out pizza place near our hotel and finally found one. 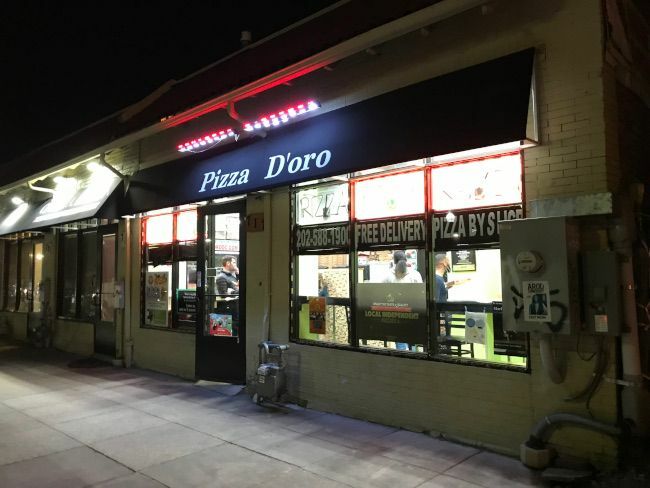 Pizza D’Oro has two D.C. locations but the one at T Street and 7th Street near Howard University was the one closest to us. Like most of D.C., parking was insane. This area has a lot of bars and nightclubs as well. It was a Friday night and parking was at a premium. Somehow, I got lucky and found a spot just across 7th Street on T. We parked and walked the half block back to the building. The small building is a typical carry-out pizza place. 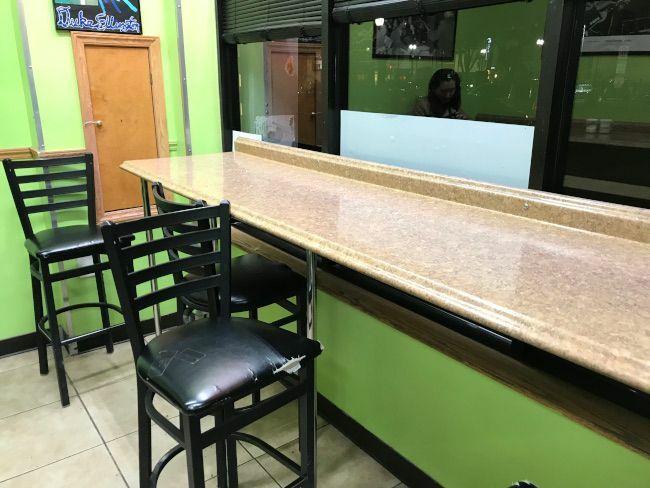 There is a very narrow public area just inside the door that has a couple of stand up counters. There were quite a few people in the store waiting for pizzas so we had to maneuver around them to get to the counter. The order area is right in front of the kitchen and right in front of the door when you walk in.. 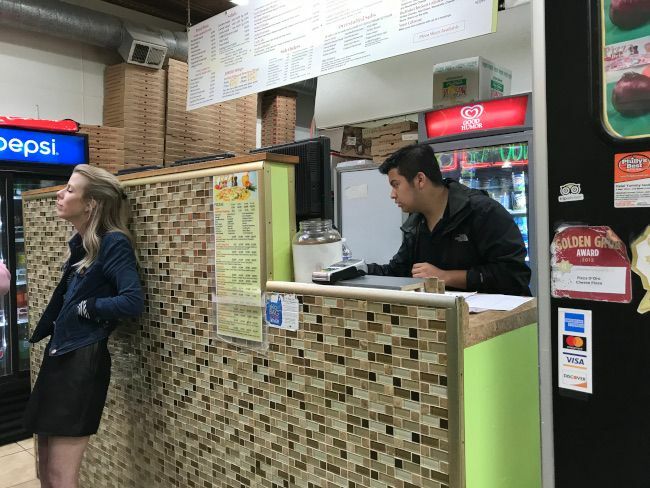 I had put in our order online when we were still downtown so when I gave the clerk my name, he turned around and pulled two pizza boxes off the shelf and handed them over. I had already paid online too so we were in and out in less than two minutes. 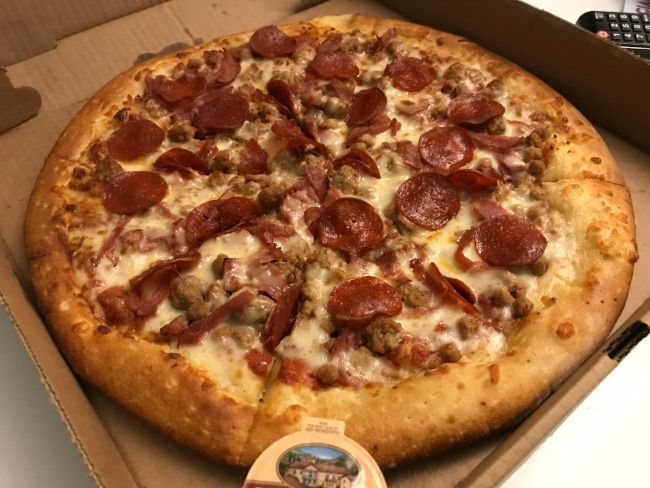 I ordered a 14″ meat lovers pizza which is topped with pepperoni, ground beef, ham, sausage, Canadian bacon, and extra cheese. The pizza had a great sweet sauce that was countered with the salty meats…and there was a lot of meat. 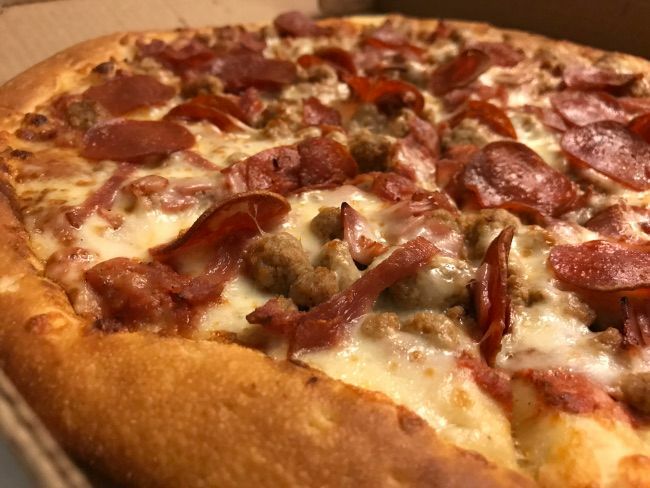 The pizza has a pretty traditional take out crust with a fairly thin crust up until the point you get to the handle part where it thickens out quite a bit. The crust itself didn’t have much flavor but the pizza came with a garlic butter dipping sauce to counter that. My co-worker ordered himself a 14″ Hawaiian pizza and I grabbed a couple of 20 oz bottles of Pepsi so I didn’t have to stop at the gas station on my way back to the hotel. That put our total bill just over $33. 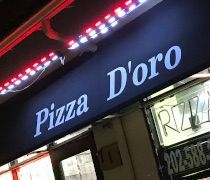 Pizza D’Oro really hit the spot for us on Friday night after an extremely long work day. I was just really wanting cheap take out pizza and though it took a little searching among all the specialty hip wood fired pizza places in the area.